Claydon clings to his mother - to her leg to be precise, for it is there that he feels safest. But Claydon's mum is an action woman. Throughout skate boarding, rugby, skydiving, bicycling, Claydon clings desperately to her left limb, while his teddy bear sounds a note of reason, pleading with Claydon to relinquish this position. Cowell's cheerful, loosely structured pen and watercolour drawings suit the active life led by Claydon's mother, and the relatively minimalist text takes flight on occasion too, to coil itself around the matching illustrations. On the final double spread Claydon is shown to have his mother's genes, as, parted from her leg, he rides his tricycle down a slide, with an anguished looking teddy in his backpack. 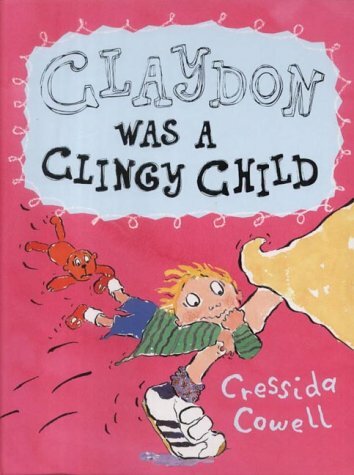 Young children may enjoy Claydon's extreme positions attached to his mother's leg, and the book may also provide opportunities for children and adults to discuss questions of independence.